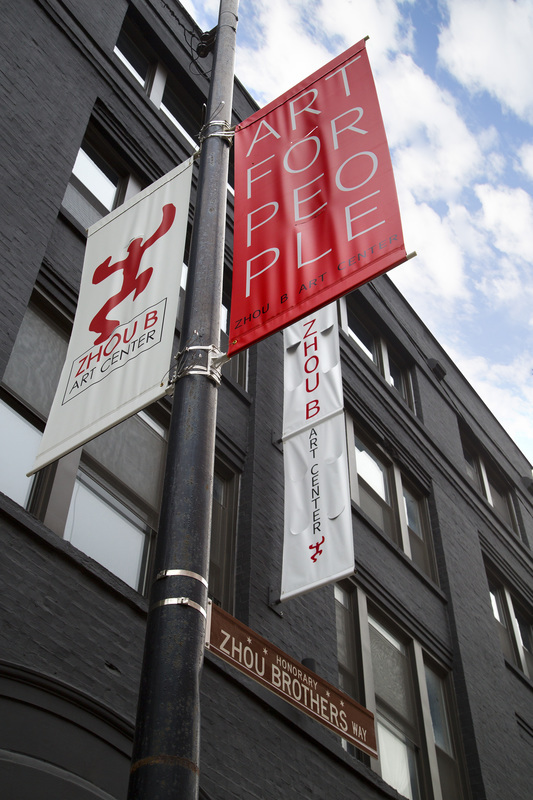 Founded by two dreamers who landed in Chicago and found success by holding onto the strength of their vision, it is no surprise that in the ten years since it opened its doors the Zhou B Art Center has been an incubator for the visions of others. With a philosophy of openness and a spirit of collaboration born from the Zhou Brothers’ body of work, the center has not only harbored some of Chicago’s most thought-provoking artists, it has encouraged dialogue between them and the community. It’s in making that space for dialogue that the center does some of its most important work—creating connections between people from disparate walks of life, which is truly essential work in a city like Chicago. We at Sixty Inches From Center view the impact that the Zhou B Art Center has had on Chicago through the lens of our own interests in the way that geography and socioeconomic factors affect the arts. In a city of neighborhoods like ours, you can expect to find a staggeringly diverse cultural landscape especially the further you begin to venture outside of the downtown area. It is in these neighborhoods where artists are most free to experiment that the arts are often the most vibrant. Unfortunately, misconceptions exist within the city that marginalize neighborhoods, especially those on the South Side of the city, and create the perception that there are few cultural offerings outside areas that are traditionally considered more affluent. From its Bridgeport headquarters, long considered a working class neighborhood, the Zhou B Art Center challenges these perceptions with a decade of contributions to Chicago’s cultural landscape. Exhibiting both international and local artists, the Center is the city’s most exciting example of what the arts have to offer on a global scale. Besides opening their doors to anyone interested and giving aspiring creatives the chance to speak with working artists in their own studios on Third Fridays, the Zhou B Art Center strengthens the city’s cultural fabric by fostering fruitful partnerships between artists and organizations. The galleries that make their home there enjoy incredible access to a diverse pool of artists, and the space makes room for groups that fall slightly outside the usual visual arts spectrum. Dance troupes, vintage china and glassware providers, and a roaming, nebulous artist collective have all called the Center home at one point. When so many creative minds are put into such proximity—particularly when they hail from such diverse backgrounds—the result is nothing less than astonishing. Though our nomadic publication has only been calling the Zhou B Art Center home for a few months, we’ve already been blown away by the incredible talent the center collects, connects, and encourages to grow. The sheer diversity of work being done at the Zhou B Art Center is what makes it such a perfect example of the arts in Chicago. From street wear and runway-ready fashion design to photorealistic paintings to towering anthropomorphesque sculpture to impossibly detailed forms carved with a chainsaw, the art at the Center defies easy categorization. Genres are mixed, barriers are crossed, artists are free to influence each other and their audiences. The exhibitions at the Zhou B Art Center have a festive atmosphere. There is a playfulness that leaves one feeling inspired—the creativity at Zhou B Art Center is absolutely contagious. We began our partnership with the Zhou B Art Center through our shared goal of creating a platform for artists, encouraging important discussions, and ensuring that art was inclusive for those who live and work outside of centers of power. They share our dedication to keeping the arts accessible, and more than that, through our partnership, we are able to foster dialogues that critically assess how to make this possible. As we evolved from a weekly blog to a quarterly journal, we wanted to anchor the work we did online in the community by hosting panel discussions and workshops, and the Zhou B Art Center helped make our transformation possible. It was at the Zhou B Art Center that we began holding those community events, and at the Zhou B Art Center that one of our first panelists made a point that resonated with us in the wake of our new partnership. The Cultural Curator of Inner-City Muslim Action Network and the Director of Gallery ONI, Janice Bond pointed out the importance of public spaces for the arts. “Ideas need a home,” she said. “They need collaboration to flourish—a place to take root.” This is what the Zhou B Art Center has given Chicago – a home for our ideas and the opportunity to be part of a new blossoming in the contemporary arts.